Attaining success while dealing with a handicap has never been easy. Jonathan Ingersoll faced his very visible problem two centuries ago and gained considerable success. 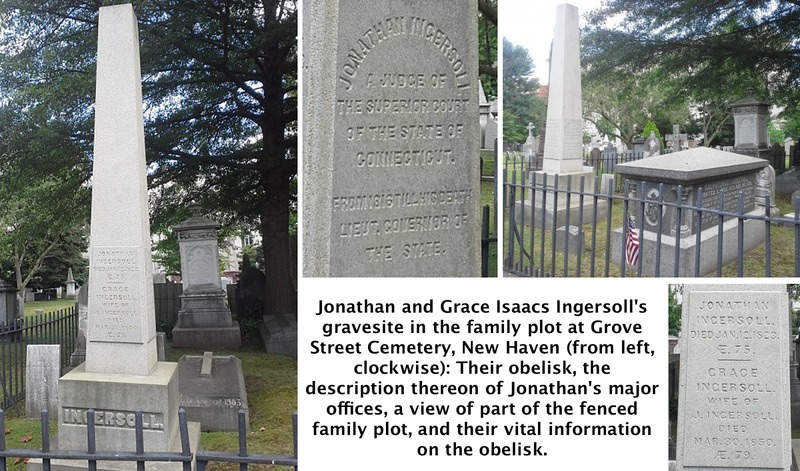 Less known in town but once a prominent person in the state was his namesake son, Jonathan Ingersoll, who was not only a political leader but the head of family whose members were remarkably accomplished. At the same time he was a man who overcame an unusual handicap, one especially difficult for a lawyer to deal with. Born in Ridgefield in 1747, young Jonathan grew up here and went off to Yale, where he graduated in 1766. He settled in New Haven, practiced law, and married Grace Isaacs. Active in the civic side of the colony, Ingersoll was elected a congressman in 1793 but wound up declining the post before the 3rd Congress convened, and was never sworn in to office. He served as a Superior Court judge from 1798 to 1801 and from 1811 to 1816. He left that job to become lieutenant governor of Connecticut, the ninth person to hold that position. He remained in office until his death in 1823 at the age of 75. In his autobiographical “Recollections of A Lifetime,” published in 1856, Samuel G. Goodrich (“Peter Parley”) discussed Jonathan, whom he had known when he was a boy and described as physically “erect” and “slender.” Ingersoll suffered from a problem that is probably what physicians today call blepharospasm. “He was marked by a nervous twitch of the face, which usually signalized itself when he began to address the jury,” Goodrich said. “On these occasions his eyes opened and shut spasmodically; at the same time he drew the corners of his mouth up and down, the whole seeming as if it was his object to set the court in a roar. Sometimes he succeeded, in spite of all his efforts to the contrary. Indeed, it was impossible for a person on seeing this for the first time, to avoid a smile — perhaps a broad one. “It might seem that such a frailty would have been a stumbling-block in his profession; yet it was not so,” Goodrich continued. “I suspect, indeed, that his practice as a lawyer was benefited by it — for the world likes an easy handle to a great name, and this is readily supplied by a personal peculiarity. Another son, Charles Anthony Ingersoll (1798-1860), also a lawyer, served as a U.S. District judge for Connecticut from 1853 until his death in 1860. His daughter, Grace Ingersoll (1786-1816) married a highly placed Frenchman named Pierre Grellet. She moved to France where, according to Goodrich, she became a celebrity at the Court of Napoleon “and always maintained a pre-eminence, alike for beauty of person, grace of manners, and delicacy and dignity of character.” Unfortunately, in 1816, she developed a “pulmonary complaint” and, as Goodrich rather darkly phrased it, “descended into the tomb” at the age of 29, leaving behind two young daughters. Grandson Colin Macrae Ingersoll (1819-1903) of New Haven, a lawyer, was a U.S. congressman from Connecticut from 1851 to 1855. Grandson Charles Roberts Ingersoll (1821-1903) of New Haven, another lawyer, was governor of Connecticut from 1873 to 1877. Finally, a great-grandson was George Pratt Ingersoll (1861-1927), who was born in New Haven but later lived many years in Ridgefield. Yet another lawyer, he was U.S. minister to Siam from 1917 to 1918 and ran unsuccessfully for Congress in 1910. His significance to Ridgefield is probably chiefly his house, which became an inn in the 1930s and is now Bernard’s restaurant — right across West Lane from the church whose congregation his great-great grandfather led more than two centuries ago.